The Rose Garden Of Berlan : Flower garden of 2,5 hectares which includes 11 500 rosebushes (75 varieties of rosebushes), hundreds of flowers, trees and small shrubs. In May 1969, the laying out of the park was decided. In October 1969, the first alterations began. In 1970, the bunks were decorated by 8500 rosebushes and perennial plants. 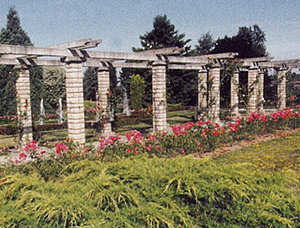 The rose park was unveiled in June 1975. Its president was Mr. M. DURAFOUR. Saint-Victor was classified ”Village des roses ” (Village of the roses) in 1975. Free guided tours for individuals - duration 2h30. No reservation. 21st June at 2 pm ­ 23rd June at 10 am ­ 29th June at 10 am ­ 30th June at 10 am ­ 3rd July at 2 pm ­5th July - at 2 pm ­ 7th July at 2.30 pm. On reservation for groups : Saint Etienne Tourist Board ­ 00 334.77.49.39.06.